Most of us can identify with the term “procrastinator.” When a deadline looms on the horizon, when unpaid bills begin to pile up on the desk, when the task at the top of the priority list nibbles at the back of our brains, a very common inclination is to just put it off. “Tomorrow, I’ll get going on the house project,” we tell ourselves. “Next week I’ll tackle that research for the upcoming presentation.” From experience, we know that procrastination leads to feelings of anxiety, guilt and low self-esteem. So why do we keep putting ourselves through this? John Perry, Professor of philosophy at Stanford University, tackles the problem of procrastination in his book, The Art of Procrastination. His big idea is that we should turn procrastination into a positive habit with what he calls structured procrastination. 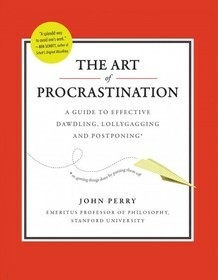 Perry continues, stating that procrastinating “does not mean doing absolutely nothing. Procrastinators seldom do absolutely nothing; they do marginally useful things, such as gardening or sharpening pencils or making a diagram of how they will reorganize their files when they get around to it.” Becoming aware of this minimizes the voice in our head that tells us we are lazy or unproductive. Instead of feeling depressed over procrastinating on one task, we can point to a whole heap of accomplished tasks that demonstrate how useful and effective we really are. These may not be the things we were “supposed” to have been doing, but any accomplished goal warrants feeling good about. Often the procrastinator feels paralyzed by the unrealistically high standards they set for themselves. The project feels too big; it seems unclear where to even begin. And as the days toward the deadline fly by, the procrastinator busies themselves with other tasks as a way to justify not working on what they are supposed to be working on. To combat this, we should do a bit of a reality check: “You have to get into the habit of forcing yourself to analyze, at the time you accept a task, the costs and benefits of doing a less-than-perfect job.” In other words, we need to implement a realistic perspective of our abilities and time constraints. To do this, we must first realize that the fantasy of perfection is just that: a fantasy. More often than not, “a less-than-perfect job will do just fine,” says Perry. This is not to advocate mediocre work. Instead, this outlook points out the simple fact that nobody on the face of the planet has ever done anything perfectly. With this in mind, it becomes easier for the procrastinator (who very well may also be the perfectionist) to free themselves from unrealistic fantasies, and sit down and get to work. 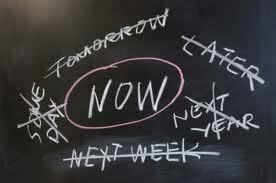 All in all, procrastination can be a negative force in your life if you make it one. Or, it can be a helpful tool. If you’re feeling rotten about having put off something important, make a list of all the things you’ve accomplished during this time. You may surprise yourself with how big the list can get. Allow yourself to feel good about these accomplishments! Were you doing all those things to avoid something else? Perhaps, but that doesn’t take away from the good work you’ve done in other areas of your life. Now you have positive momentum, so use it to start the thing you’ve been avoiding. Free yourself from the fantasy of perfection, and be confident that by stressing over the work, you’re demonstrating that you care about the outcome. Good work will follow. Perry, John. Date. The Art of Procrastination. New York: Workman Publishing Company, Inc.